Imagine if a new government were to pass a law that makes it mandatory for people to wear the dhoti and sari in public places. Wouldna��t there be a national outcry? Even the more-sanskari-than-thou Alok Nath may think twice about endorsing the move as ita��s an open transgression of personal freedom. A city name change enacted via government diktat is akin to the enforced costume makeover. The only difference being, there wona��t be a pipsqueak of protest as nobody really loses sleep over place names in India. Yes, there might be the odd hot headed Tweet about how uncool Bengaluru is or how Chikkamagaluru is a worthy candidate for a spelling bee contest, but fact is that no editorials will be written, no celebrity will speak out, no a�?kiss of lovea�� protests will be staged, as the issue is largely perceived to be a non-issue. 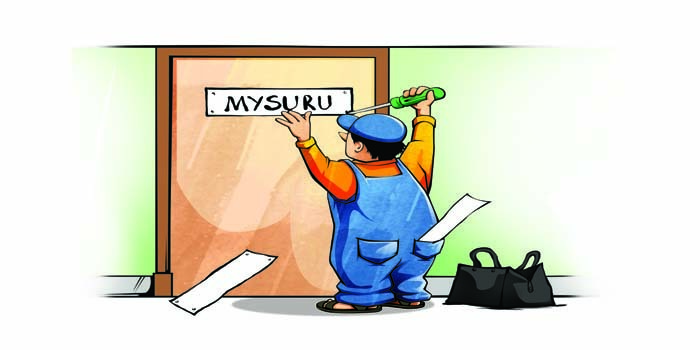 My gripe with the rechristening is not on whether Mysore should be called Mysuru. Ita��s about the singular lack of discussion and public involvement before the decision was made. In these times when cities are seen as brands, a name change should only be effected after considerable debate among all stake holders. I mean, whata��s the idea of renaming Madras as a�?Chennaia�� when Madras High Court, University of Madras and Madras Stock Exchange decide to retain their original names? The same process is going to play out in Bengaluru. Bangalore University, is in all likelihood, going to retain its name. Wikipedia, Lonely Planet and zillions of outsiders are still going to refer to it as Bangalore. So why waste billions of rupees in repainting road signs, rewriting maps and reprinting stationery all for the sake of puffing up cultural pride, 67 years after independence? A place name change is kosher, only if backed by a groundswell of popular support. Here we can learn from processes put in place by several American states and municipalities. A name change form is available for download at the government website. Those in favour have to mobilise 51 per cent support in their area. Then the motion is presented to a government body which in turn forwards this to a committee that holds a public hearing listening to all the pros and cons before sticking its neck out for the proposal. Sadly, none of this was followed in Bengaluru and Mysuru. All that was achieved was, wea��ve been short changed in the guise of a name change.